Looking at Red Adams’ career Major League stats, one might assume that he was washed up at age 24, pitching only 12 innings for the Chicago Cubs in 1946 with a bloated 8.25 ERA. Lost in the translation of his cup of coffee was a 19-year minor league career that spanned over 3,000 innings and opened the door for another three decades as a scout, pitching coach, and instructor for the Los Angeles Dodgers. Adams died Wednesday January 18, 2017 at the age of 95 in California. He left behind a lifetime of memories that came from a half-decade association with a game that he admits he wasn’t ready to play when he signed his first professional contract in 1939. While Adams was learning the finer points of the game playing at the lowest rung of the minor leagues in Bisbee, Arizona, he suffered a severe injury that threatened to cut short a career that was just starting. An evening of horseplay with his roommates left him with an injury that would have stopped his career dead in its tracks if he played any other position besides pitcher. His arm injury was so debilitating, that when he went to register to serve in World War II, he was declared unfit for participation. It was a label that he despised having. 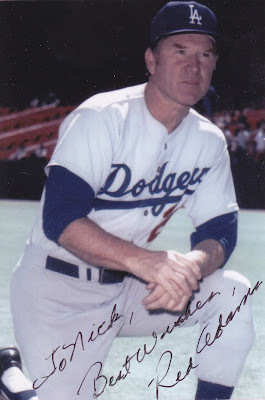 A few years later after his devastating injury, Adams ascended his way to the major leagues, pitching with the Cubs in 1946 after posting a 9-4 record with a 2.68 ERA for the Los Angeles Angels of the Pacific Coast League. It was in that league where Adams truly built his career, playing the next 12 seasons in the PCL while the league earned an Open classification from professional baseball. He experienced a breakout season in 1952 with Portland after returning invigorated from an appearance in the Caribbean Series with the San Juan Senadores from Puerto Rico. At age 30, he found a new lease on his pitching life. Modern-era executives might now recognize his low earned run average as a sign of his effectiveness and discount his hard luck losses, but in 1952, management was quick to pin full responsibility of the ledger on their pitchers, no matter the ineptitude of their offense or defense. Adams said that the scenario he described was common in the minor leagues, as players had little choice in their movement due to the reserve clause. Despite the salary cut against what he felt was effective performance, he still felt that playing in the Pacific Coast League had many benefits in the 1950s. During our 2009 conversation, Adams reflected on how fortunate he was to work with the Dodgers for such a lengthy period a time. After considering how his career was almost truncated due to a careless injury away from the field, he marveled at the fortune that turned it into an almost 50-year journey in the sport.